Today: How to get the best hard-cooked eggs in no more than 15 minutes. A couple weeks ago, we nearly broke the internet with Alton Brown’s method for hard cooking eggs in the oven. Many of you wrote in with other methods for hard cooking eggs besides plunking them in scalding water and hoping the shells don’t crack—the most popular of which was steaming the eggs. As J. Kenzi López-Alt explains over at Serious Eats, steaming results in evenly cooked, tender eggs. While you can't simultaneously cook as many eggs as in the oven method, steaming does take less time. In a big pot with a metal steamer inside, bring 1 inch of water to a boil. 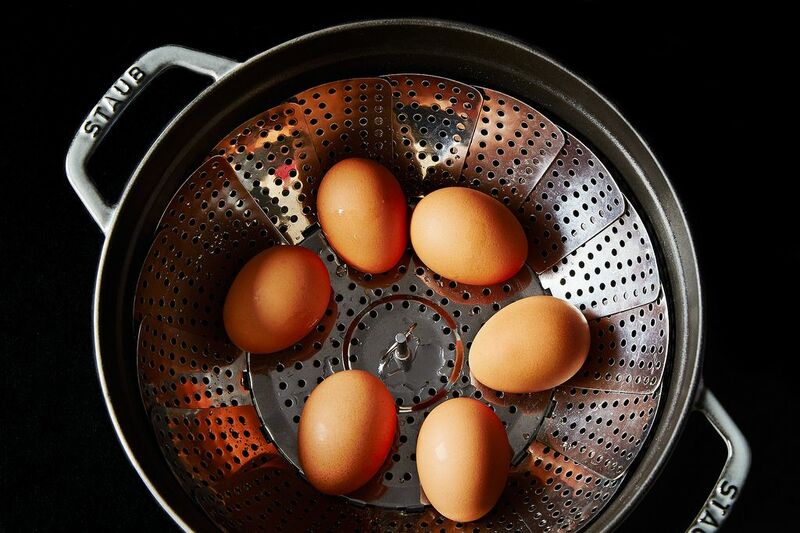 Add your eggs directly from the fridge to the steamer—we could fit 6 without overcrowding. Cover the pot and let the eggs cook for 12 minutes (6 minutes for soft boiled). If you plan to eat them cold, transfer the eggs to an ice bath, let them chill out until you can handle them, then peel them. More: The best way to peel eggs. In the end, the eggs were indeed perfectly cooked—the whites tender and the yolks anything but chalky. We did find peeling to be a little tricky (we lost a bit of whites in the process), but we overall would use this method when we want a handful of hard-cooked eggs for a springtime salad or a not sad desk lunch. What's your favorite way to hard cook eggs? Do you like the muffin pan method? Who knows: We may try another method next week! Yes! I made them tonight and they are PERFECT. But the yolk was not at all creamy, just kind of bright yellow and perfectly smooth. Hard cooked eggs should not be "creamy". They don't have to be dry and chalky, but they should not be creamy. I feel like I'm taking crazy pills. Five minutes in my Instant Pot — perfect eggs, easy to peel even a week later. I steam a dozen eggs at a time, quick-release the steam, and place in cold or ice water briefly afterward. Hallelujah! Instead of using the same old Betty Crocker method I've used my whole life, I searched Food52 for tips and found the oven method, but mixed reviews led me to this steamed method. On my first pass, I crowded a dozen eggs into the steamer basket. Eleven came out perfect, one was a bust, but we used that one to taste test. First, it peeled really easily. Then, the white looked and tasted good, but the yolk - Oh my! Brilliantly yellow! And until this day, I never knew there was such a thing as a "creamy" textured yolk. I always thought they were SUPPOSED to be hard and chalky tasting. I feel like singing "A whole new world....."! What I like about steaming eggs is there isn't that nasty dark ring around the yolk, I use a push pin to pierce the large end of the egg and heck, I'll steam mine for 25 mins and I also warm the eggs from the frig in the microwave, but usually only do 4 at a time, I let the eggs cool to room temp on their own, no ice bath. Then I refrigerate in a jar with lid on, I've peeled them and put them in the brine from Jalapenos, gives 'em a nice tang but the whites get a little rubbery, still good though with a splash of hot sauce. I've slipped a small piece of 1" hose over my bathroom faucet and tap both ends of the egg and put the large end tightly against the hose and pulse the water and it tends to help separate the white from the shell, I've never found any way to peel eggs easily a 100% of the time, usually have a stubborn one from time to time. Adios n' Hasta La Bye Bye! L.D. My Krups Egg Cooker puts out perfectly cooked eggs every time. I've been steaming eggs for a few years. No holes or anything. If one does go kerplewy, I feed it to my dogs. I steam mine for 16 minutes, I don't bother with an ice bath afterwards. I find they're much easier to peel than boiled eggs. I do mine on the steam function of my rice cooker. 10 minutes on the timer and then into an ice bath. Perfect every time. These are just typical store bought eggs with no holes or other modifications. I, too, have tried this successfully. I did poke a hole in them - so I don't know how well it works without doing so. They peeled nicely. I've steamed them in my insta-pot, in my egg cooker, and on the stove. I deviated from this for Easter, however, because for dying, I didn't want holes in the shell. So, I tried the Alton oven method. We have a large family, and it was a breeze to bake 6 dozen eggs in the oven - not a single one broke! I'll use the oven for mass cooking and stick to steaming for the small stuff. I have chickens so my eggs are never refrigerated...how long would one steam them to yield perfect results given that they aren't cold from the fridge? Stay with the plan. The Yoke will give you the answer. EGG PEELER ALERT >>> Before you boil an egg take a plastic push pin and put one hole in the fat end of the egg. This allows a tiny bit of water in and loosens the membrane. Cool the egg and roll it on the counter. The shell almost falls off with no effort. I put the eggs in water and bring them to a boil for 2-3 minutes then turn the heat off and let them sit for 7-8 minutes. They are perfect every time. If you are a serious egg eater, get the Cuisinart Egg Central. It makes perfect eggs (hard, medium, soft) as well as omelets (though I don't use it for those). Peeling is a sinch. The way it works is you poke a tiny hole on the top of the egg (it comes with a contraption to do this). The steam it lets into the egg makes the shell separate easily from the membrane. This gadget is a life-changer. One of the chefs I studied under in culinary school swore by this method. But 13 minutes was his time for hard boiled. He would use a hotel pan with a strainer insert to do a larger volume of eggs. Finally after many years of trying to figure out the best way to hard boil eggs I have the perfect method! Eggs must be room temp,bring a pot of salted water to a boil and then spoon in (I do 2 at a time) the eggs. Time them for exactly 12 minutes. When water comes back to a full boil reduce heat to a gentle but rolling boil.When timer goes off remove pot from stove and run cold water into pot to cool eggs down. when eggs are cool drain water from pot by pouring water out of pot with eggs still inside. Now shake the eggs back and forth in pot to crack shells slightly then add cold water. the cold water will get between the shell and egg making it beyond easy to remove the shell. Peel eggs and put them in a sealed container. The most tender whites and creamy yolks I have ever eaten. Keeps in fridge for a week. Rice cooker here. 10 minutes on the timer using steam function then into an ice bath. Perfect hard boiled every time. Bring water to boil with eggs inside. Turn heat off and leave on burner for 8 minutes. We do this every morning and it makes perfect eggs the fastest way we know how. The older the eggs the easier they are to peel.